The Jaguar MKII was one of the great all-rounders. Pretty much anything you wanted from a car, it would do. Indeed, so versatile was the 'MKII Jag' that both cops and robbers fell in love with it! There was a shared reason for that. The top-spec 3.8 version - with manual overdrive - was good for 125mph. And with no speed limit on British roads at the time, you could make the most of that number. Not that observing the speed limit would have been top of the robbers' list of priorities! Saying that, the MKII Jag was also the ideal commuter-car for the business class. As refined as you like when it wanted to be, the MKII would ferry its well-heeled occupants with sumptuous ease. The Jaguar MKII, then, was all things to all men and women. Included in that was that it was - like all Lyons' cars - affordably-priced. Not surprisingly, then - for a car with such universal appeal - the MKII got a call from the movie studios. It played cameo rôles in Performance, alongside James Fox and Mick Jagger - and Get Carter, in which it was hard on the tail of Michael Caine. On TV, Inspector Morse would not be seen in anything else. Of course, such sashaying across screens did the car's sales figures no harm at all. 83,980 MKIIs were built. At race-tracks, too, the Jag played a starring part. In saloon-car showdowns, it was highly competitive. And the fact that legends like racing driver Graham Hill, and Lotus boss Colin Chapman owned MKIIs only added to its mystique. Certainly, the MKII was beautiful to behold. And that, really, was the reason for its popularity. Stock-broker, or law-breaker ... either way, in a MKII, you looked like $1,000,000! The car had Sir William Lyons' stamp all over it - both in terms of styling and engineering. Inside, the leather seats, wooden dash and door cappings, and dial- and switch-encrusted facia - all displayed Lyons' keen eye for design detail. On the performance front, the MKII used tried and tested Jaguar technology. Its straight-six XK engine delivered 220bhp in 3.8-litre format. For a while, that made the MKII Jag the quickest saloon car around. Technically, it was released in '59 - though it will always be synonymous with the Sixties. 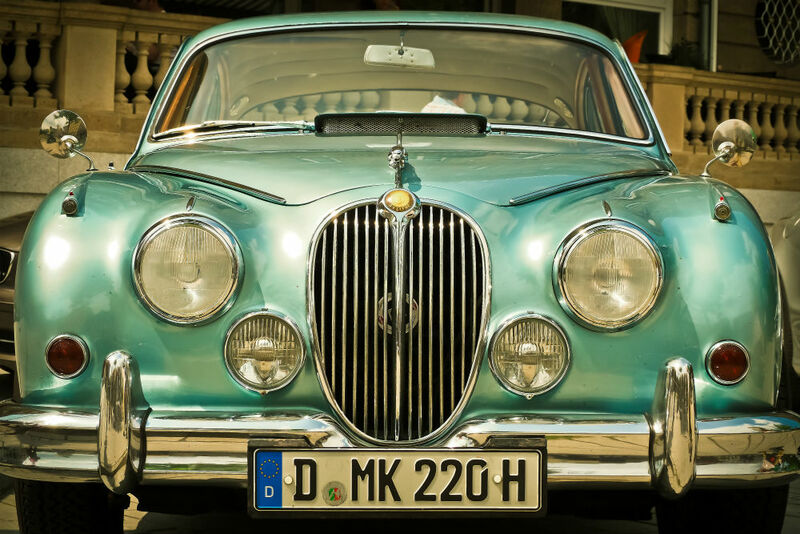 Instantly recognisable, the Jaguar MKII defined its times. Or, in other words - it was a cast-iron classic car!